Where is Pin valley national park? 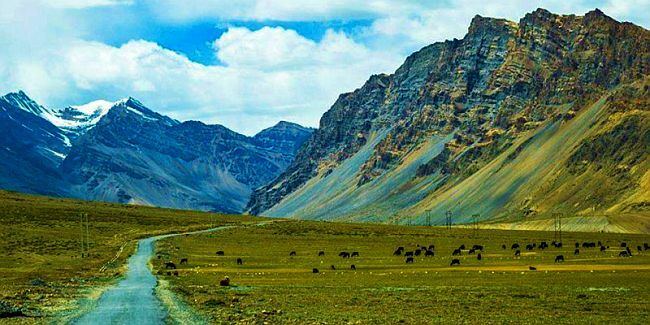 It is located in Lahaul & Spiti in Himachal Pradesh. Its a cold desert, domainated more by the Tibetan culture. There are around 16-17 villages around, which are sparsely populated. The pin valley is usually covered under a white blanket of thick snow throughout the year. For adventure lovers it is a ideal destination. What to see in Pin Valley? The Park forms a natural habitat for a number of endangered animals including the snow leopard, Siberian ibex, blue sheep etc. In summer one may come across young ibex fawns drinking water from the natural pools in the valley. In summer, rare birds such as the Himalayan snowcock, chukar partridge, snow partridge and snowfinch flourish in the park. The bearded vulture, ravens and Golden eagle scour the skies. The house sparrow is also seen at this altitude. The Tibetan wolf, red wolf, the Himalayan brown fox and the Tibetan gazelle are seen here. Himalayan marmots, snow hare and mouse hare are commonly seen. The climate is dry, freezing which drops to -35 in winters. Heavy snow fall from Dec to March. Summers start by May to September, where temp reach upto 25 degrees, but still nights are freezing. The best time to visit is August. July to October is when the park is accessible. Best sightings are made in April - May and Nov when the animals come down to the valleys. July to August is the best time to view the flora of the place. The nearest airport is at Bhuntar in Kullu district. Shimla at a distance of around 440kms(approx) is the nearest railhead. Manali is around 250kms(appox) away. By road - The first route is via Manali - Rohtang Pass - Kunzum La. This route is open from July to October. The second one is via Shimla - Tapri - Kaza. March to December is the best time to approach the park via this route. Pin Valley is accessible only by road, and the last leg of the journey can only be undertaken on foot. The nearest town is Gulling. Stay is limited. Bunkers provided by the Forest Department inside the park in Thango. They are limited in number. You can carry your own tents and sleeping bags. Tourist Lodge, Kaza, The lodge is open from May to October only. Hotel Himalaya, Gulling Village, Spiti, Narzang Guesthouse, Sagnam Village, Spiti are the stay options. One can also look for stay in the local villages and monasteries. The park is opne from 6am to 6pm all days of the week Special restrictions: Special inner line permits (IPL) is required for any travel within 40 km of the Tibetan border. The permit is not needed to travel from Lahual to Spiti. Pin Valley has one of the most beautiful treks in Himachal state. Plan around 10 days for an ideal trek vacation. The more popular route being from Manali, travel via Rohtang to Spiti. Then from Kaza to Mikkim and then to Pin valley. Or one can start from Shimla and end the trip in Manali. The area becomes all colorful with flowers during July and August. The Mikim-Debsa walk is a moderate rated trek while the Pin Parvati trek is a difficult one suited for trained trekkers. The Mikkim Debsa Mikkim walk is a moderate trek with an ascent of 3600 to 400m which is a round trip of 3 days with stoppage at Thango. The trek has views of Kalataro, Paraiho valley, Shigri parvat and can spot medicinal herbs, wild flowers and ibex. The pin valley trek fo 9 days is difficult which involves crossing the pin parvati pass from the Great Himalayan National park. It is difficult to cross Pin Parvat and Bhaba Pass as it involves snow treks. Dhankar Gompa (monastery) was built nearly 1000 years ago. Many herbs are grown around the monastery which is famed to cure heart and lung ailments. The statue of 'Vairochana' called the Dhyan Buddha can be seen here. It consists of four figures seated in a line. Tabo Gompa - Tabo Gompa (monastery) is the largest monastery complex of Buddhist religion. This monastery houses a priceless collection of manuscripts, paintings, frescos, clay statues and murals - all depicting the tales from Mahayana Buddhism in Tibetan style.